Given that broad request, it is not surprising that we received prognostications that were all over the map. Some were quite specific while others were vague visions of a utopian future, personal statements of belief (that’s the way things should be! ), or fervent hopes disguised as predictions. 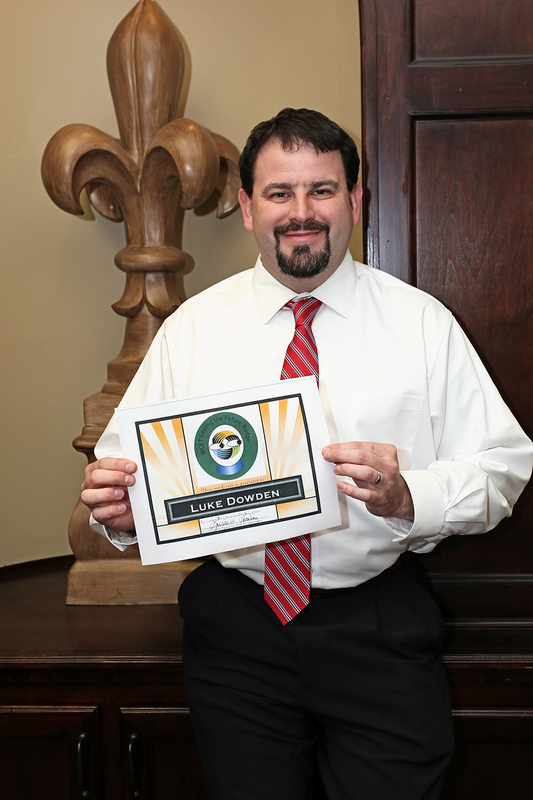 Luke Dowden of the University of Louisiana Lafayette proudly displays his “WCET Seeing the Future” award. It’s a year later. How did you do? What do you predict for 2014? What happened? : While not all of that happened, San Jose State’s faculty were certainly vocal about the MOOC experiment on their campus and the New Faculty Majority (which advocates for adjunct faculty) became more visible. What happened? : While there was not a wholesale change on this front, the issues of badges and alternative credentialing kept appearing. Mozilla’s Open Badges experienced 1,400% growth and the emerging competency-based programs value demonstrated knowledge over seat time. Even MOOC providers seemed to realize that they needed to offer more meaningful credentials as credit-based and authenticated MOOC certificates emerged. What happened? : The rise of Straighterline, Khan Academy, and other low or no-cost providers did not start in 2013, but most of them were strengthened this year. What impact will these new providers have on traditional institutions? What happened? : The State Authorization Reciprocity Agreement is well on its way. Finally, my condolences to Mac Adkins of Smarter Services who used a sports analogy about coaches (or managers in their roles as coaches) paying attention to “process.” Such attention to detail lead to the recent success of the University of Alabama football team. That led him to predict a third straight national collegiate football championship for the Crimson Tide. Well…there was a third straight national collegiate football championship, but it was the North Dakota State University Bison (pronounced Bizon) that did the trick last Saturday. You are invited to join in the fun for 2014. Predict something that will happen this year regarding teaching, learning, technology, business of e-learning, policy, regulations, student behavior, or other related items. You can submit your entry as a comment to this blog post or by sending an email to me at rpoulin@wiche.edu with the subject “2013 Prediction” by Friday January 24. Polish your crystal ball and join the fun. Happy New Year from all of us at WCET. Open online courses will become more plentiful with smaller levels of enrolment. As the hype reduces, organisations and individuals will produce cheaper open courses with lower production values but which are not necessarily less effective. Online learning market-based innovations requires a participative approach (with higher education faculty, administrators, and staff collaboration) to maintain quality e-learning operations. In 2014 the shift will be to discussions about credit and quality, both in the MOOC world and in the world of more traditional methods of distance education. I think we will do some in-depth work on learning how community and interaction play a huge role in student success in online learning, as we are informed by an increase in data from learning analytics and by conversations with experienced distance educators and their students.